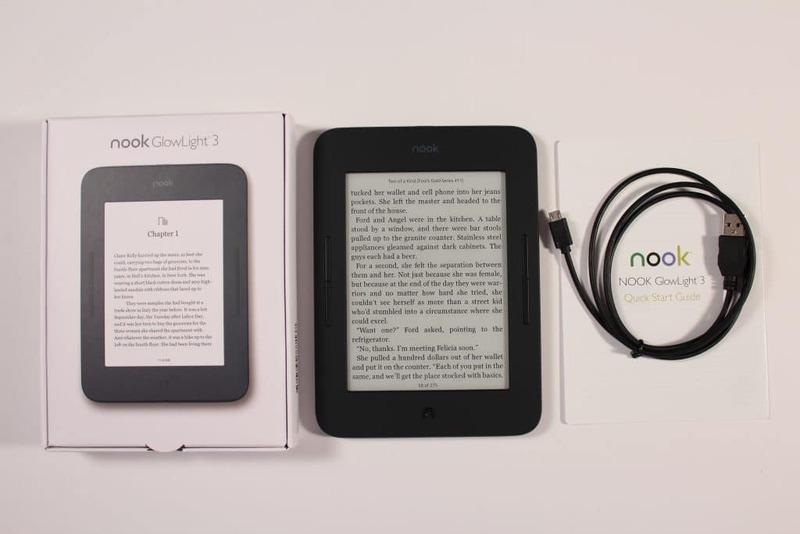 Barnes and Noble is having a Black Friday sale on their latest generation Nook Glowlight 3 e-reader. The regular price is $119 and it will be available at an incredible price of $89.99, starting online on November 22, and in store and online from November 23 through Cyber Monday, November 26, while supplies last. The bookseller is also discounting the brand new Nook Tablet 10.1 from its regular price of $129 to $119.99 during the same timeframe. Signed Editions: Starting on Black Friday, November 23, Barnes & Noble is bringing back its customer-favorite Signed Editions program, with its largest offering yet of autographed books from acclaimed authors. Featuring top authors across a wide variety of genres, who have taken the time to autograph thousands of copies of their popular books for readers of all ages, Signed Editions make for a special gift this holiday season. Customers will be able to pick up these coveted editions in stores beginning on Black Friday and continuing throughout the holiday season, while supplies last. BOGO 50% off Toys & Games: Barnes & Noble will be offering a buy one, get one 50% off deal on its leading selection of toys & games including science & technology, plush toys, games & puzzles, and arts & crafts. Customers can take advantage of this incredible deal online starting November 22, and in store and online from November 23 through November 25. 50% off Gift Book and Collectible Editions: Customers can receive 50% off gift books and collectible editions, including Hindsight by Justin Timberlake and The New Yorker Encyclopedia of Cartoons, online starting November 22, and in store and online from November 23 through November 25, with collectible editions also available for 50% online on Cyber Monday, November 26. 50% off Best Young Adult Books of 2018: The best YA books of 2018, including Dear Evan Hansen: The Novel and Archenemies, will be available at 50% off online starting November 22, and in store and online from November 23 through November 25. 50% off Best Young Reader Books and Picture Books: This year’s best young reader books, such as the B&N Exclusive Edition of Carl Hiaasen’s latest, Squirm, as well as classic picture books such as Maurice Sendak’s Where the Wild Things Are, will be available at 50% off online starting November 22, and in store and online from November 23 through November 25. $10 Holiday Picture Books: Holiday picture books such as Miracle on 34th Street and Santa’s Magic Key will be available for $10 online starting November 22, and in store and online from November 23 through November 25. 50% off Exclusive Editions Fantastic Facts & Feats: Grab exclusive editions of Ripley’s Believe it or Not and Guinness Book of World Records, with exclusive content only available at Barnes & Noble online starting November 22, and in store and online from November 23 through November 25. BOGO 50% off Activity Kits: Barnes & Noble’s diverse selection of activity kits will be available at buy one, get one 50% off, online starting November 22, and in store and online from November 23 through November 25. Harry Potter Gift with Purchase: Receive a set of four exclusive Harry Potter Minifigures with any LEGO® purchase of $75 or more, while supplies last, online starting November 22, and in store and online from November 23 through November 25. Free $10 Barnes & Noble Reward Card: With a purchase of $50 or more in Barnes & Noble Gift Cards, customers will receive a free $10 reward card for use on any and all last-minute holiday shopping. This promotion is available online starting November 22, and in store starting November 23, through Cyber Monday, November 26. The $10 reward can be redeemed beginning December 28 through February 28, 2019. Google Home Mini Bundle: This ultimate bundle includes Google Home Mini, Mickey Ears Stand and any three compatible Disney Little Golden Books for only $49.99 online starting November 22, and in store and online from November 23 through November 25. $10 off exclusive Lord of the Rings Funko Mystery Box for only $21.95 in store and online November 23 through November 25. Contains two POPs! while supplies last. 30% off all magazines, customers can choose from thousands of titles, in store only on November 23. BOGO 50% off any Godiva® chocolate $10 and up in store only from November 23 through November 25. Offer applies to lowest-priced qualifying item, while supplies last. James Patterson’s Target: Alex Cross, 50% off in store and online from November 19 to Cyber Monday, November 26. 50% off Moleskine, in store and online November 21 through Cyber Monday, November 26. 50% off all Television Media DVDs and Blu-Ray in store and online on November 24 only. 25% off all Entertainment, Toys and Games (excluding LEGO®s), online only on Cyber Monday, November 26. 25% off S’Well water bottles in store and online November 21 through Cyber Monday, November 26. $5 Stocking Stuffers in store and online November 23 through November 25. 25% off Toys, Games, & Collectibles, beginning at 12 AM EST Monday, November 26, and ending at 2:59 AM EST on Tuesday, November 27. CDs up to 60% off beginning at 12 AM EST Monday, November 26, and ending at 2:59 AM EST on Sunday, December 2. DVD & Blu-Ray up to 60% off beginning at 12 AM EST Monday, November 26, and ending at 2:59 AM EST on Sunday, December 2. Great Gifts 3 for $25: Mix and match from hundreds of items across books, toys, games, collectibles, and gift, starting at 12 AM EST Tuesday, November 27, and running until 2:59 AM EST Wednesday, November 28. The Glowlight is a pretty good ereader considering it is B&N. Do you have one? I have a Glowlight 3 and do not use it that often. I like the comfort light but find the device very slow. I usually switch to reading on the iPad Nook app. The Nook was my first ereader and I have over 900 Nook books but I haven’t purchased any books from them in awhile and have no plans on doing so nor of buying any more devices from them. I do not trust in their future and would rather invest in Kobo or Kindle instead. You can read epub on it though, so any store besides Amazon right? I wonder if I can get ahold of a signed copy of Michelle Obama’s book. A signed first edition would be nice. Probably a wise move, given the apathy B&N has towards the Nook. So nice. How would you find out if she signed any? Is there a resource for that? I posted something today that lists every single autographed book they are offering.